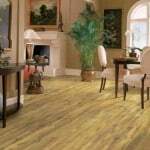 Most new vinyl and similar resilient flooring materials have “no-wax” coatings that stay glossy with just basic cleaning. 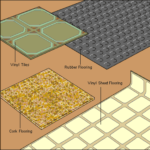 Resilient floors that don’t have these types of coatings require more maintenance. Recommendations for basic cleaning vary by manufacturer, but a typical procedure for a no-wax resilient floor is to sweep and mop with a pH-neutral liquid floor cleaner—the best products are available through flooring retailers. Follow by using a sponge to rinse with clear, clean, warm water and allow to dry (or speed up drying by wiping with a clean towel). If you have a resilient floor that does not have a no-wax finish, you will probably have to strip, clean, and re-wax it to get it looking glossy again. This is a big job that requires 1) buying a quality wax stripper from a janitorial supply, 2) clearing the floor area of furniture and obstacles, 3) applying the stripping solution to sections of the floor with a mop, 4) scraping up the old wax with a squeegee, putty knives, rags, and scrubbing pads, 5) mopping up each completed section with clear water, and then 6) applying a new coat of liquid wax. Spilled liquids and food should be wiped up immediately before the stains become harder to remove. A clean cloth dipped in pH-neutral liquid floor cleaner is often the best bet. 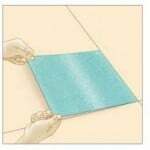 Scrub balky stains with a nylon pad, but be careful not to abrade the floor’s surface. Don’t use abrasive cleaners or mechanical buffers on high-gloss floors—this will weaken the protective coating.